"The last thing a buyer wants to discover is that local zoning laws won't allow them to live in it! Before buying, check all local regulations." When you start visiting tiny home builder websites, you quickly realize these miniature residences aren't cheap. Prices for tiny homes as small as 200 square feet of comparably cramped living space can start at nearly $70,000, and the prices can increase significantly, depending on quality of materials. One thing many tiny home buyers sometimes forget to take into account, is that the price of the home does not include the land the home will eventually sit on. And, when you consider the fact that bathrooms average less than 3 feet wide, often contain recreational vehicle toilets, and have little or no plumbing, and the kitchens may not include normal appliances, that's a pretty high price tag for such a tiny space. Many cities and towns have zoning regulations regarding the amount of square feet a living space must have. The last thing a buyer wants to have happen is to purchase the land, build a tiny home, look forward to moving into their new ultra-efficient living quarters, only to discover that local zoning laws won't allow them to live in it! Before you make any decisions about purchasing a tiny home, it's imperative to check all applicable regulations. Does the town require you to hook up to their water? If that is a requirement, it can cost thousands of dollars for plumbing alterations. Do the research before you buy a piece of land. Setting up a tiny home can cost as much as a traditional home, without most of the conveniences. "Tiny houses are obviously very small! Be sure to consider storage costs, unless you plan to sell most of your belongings." Do People Live In Tiny Homes? Research on the internet, and you'll find stories from people who lived in their Tiny Homes for a short period of time, as the reality of living in such tight quarters becomes apparent. Some owners build the homes and decide to rent them. A few people manage to live in a tiny home for a few years, but many other people discover tiny homes don't meet their lifestyle or family needs. While the idea of living more simply or off the grid can be appealing in our hectic world, the reality is very often not what people expect. Moving into a tiny home means disposing of or storing most of your belongings, because obviously, tiny homes aren't known for their ample storage space. And storage space costs money. There may be only a couple of cabinets for food in the kitchen area. Refrigerators are usually very small and fit under a counter. Loft bedrooms are very low, and placing a mattress on the floor serves as a bed. You can also have seating downstairs that serves as a bed at night. Some loft stairs have built-in drawers below them for clothing. And for some people, having no separate space to go when they want to enjoy some alone time, can be a major problem. Since almost all tiny homes are built on a wheelbase and can be more easily transported, you need to research how your state & insurance companies may determine tiny home insurance. Every state's laws are different, and each insurance company has it's own rules and underwriting standards too. You want to be sure you will be adequately covered by insurance in the event the tiny home is involved in an accident or a fire, and what types of events are covered under the insurance policy. Do Tiny Homes Retain Their Value? 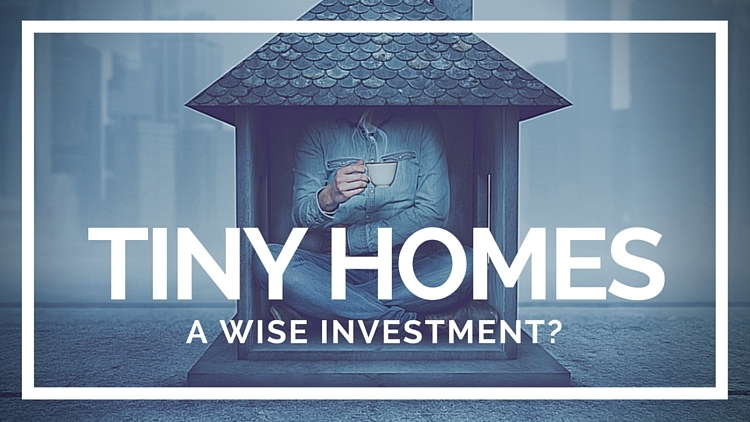 One last very important factor to consider, is if Tiny Homes are a wise purchase from an investment perspective. Because most tiny homes are mobile rather than permanently fixed to the land, they may likely be treated as a depreciating asset, rather than true real estate. Obviously, in such cases it's not practical to expect the same type of return on your investment, compared to a traditional home. Resale potential is definitely something to consider before spending additional money on expensive building materials and interior upgrades. Fortunately, there are cozy and small traditional homes which can house a family comfortably, provide storage, give them roots in a community, and allow the potential for the homeowner to build equity. You don't need to give up the conveniences of being connected to town water, electricity, and cable to live in a cozier space. Either way, if living more simply, and with a smaller footprint is the goal, be sure to consider all smaller home or condo options before spending your savings on a tiny home. Don't jump on the Tiny House bandwaggon without carefully considering all of your home buying options, because doing so may save you many thousands in the long run, and will give you peace of mind when it comes time to make a final decision. Making the leap to tiny living is an exciting, and unique journey. For those who aren’t familiar with tiny houses, they are typically no more than 500 square feet and either on wheels or built on a foundation. While many tiny home enthusiasts choose to build their own, it isn’t uncommon for others to be more interested in a turnkey model. However, there are a few things to consider before moving into a “ready-made” tiny house. Here's a look at some mistakes to avoid when buying. Before purchasing a tiny home, it’s important to consider the number of people who will be living in it. A tiny house that’s perfect for one person likely won’t work for a family of four. A good rule of thumb is to factor in approximately 100 square feet per person. The lack of square footage lends itself to a more intimate setting—owners will want to consider the dynamic between them and whoever else is living there. Buying a tiny house that’s too small for the number of people living in it could be uncomfortable. Another reason to think carefully about the size of a tiny home is if it’s on wheels. Be sure to buy a tiny house that feels comfortable towing behind your vehicle. It’s extremely dangerous to tow a tiny home at high speeds and in weather outside of your comfort zone. Generally, the smaller the tiny home, the easier it is to tow. However, others may be contracted out to do the towing for owners should this be an issue. As incredible as the tiny house lifestyle is; tiny living isn’t for everyone. Living tiny focuses on simplicity and minimalism. If an office space or walk-in closet is a big draw or priority when house hunting, then going tiny full-time may not be the best option. If you aren’t sure about purchasing a tiny home, consider trying one out first. Renting out tiny homes of various shapes and sizes might help determine what works for you. Camping is another great way of figuring out a household dynamic in close quarters. If you’re interested in some great tiny house rental ideas, read more here. Buying tiny requires planning. Another mistake tiny house enthusiasts often forget to consider is finding a place to build or park their tiny home. In other words, they forget to find a home for their tiny home—which can be a bit more complicated than one might think. Parking or building just anywhere isn’t an option. It’s important to find out the local zoning regulations for your area beforehand to avoid fines and other roadblocks. Tiny living has a lot to offer for those who want a way of living that focuses on quality over quantity. With proper planning and research, tiny house enthusiasts can be sure their tiny house is right for them.